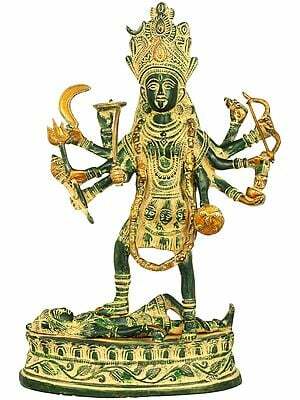 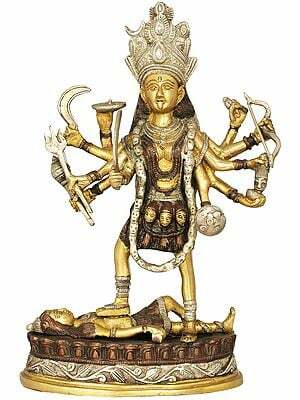 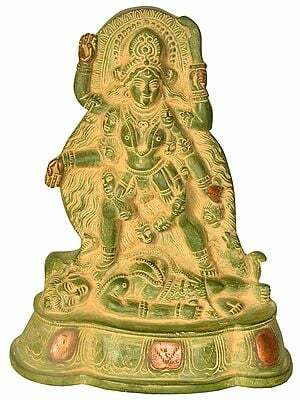 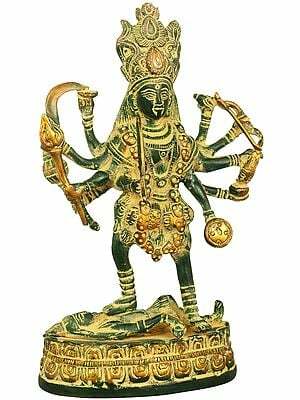 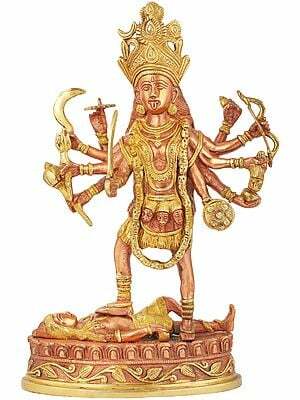 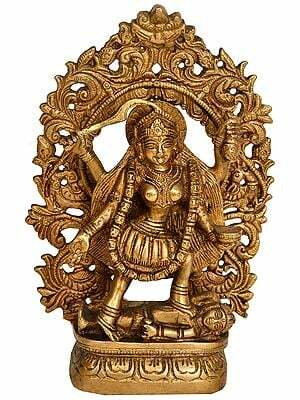 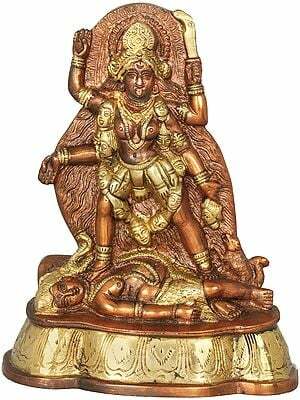 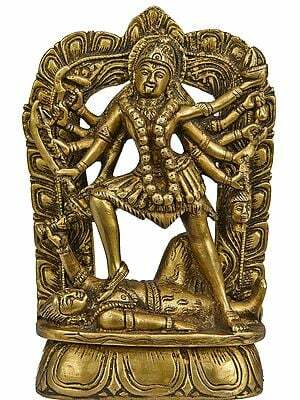 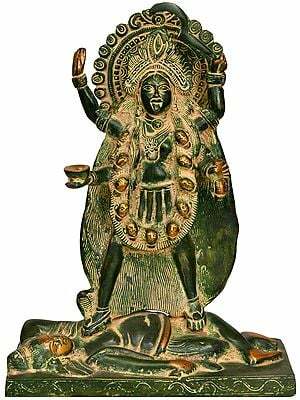 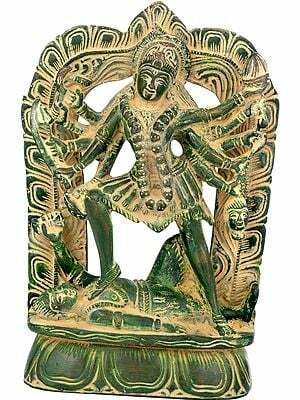 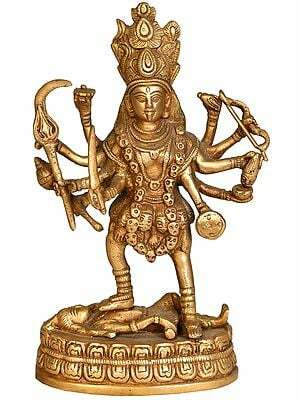 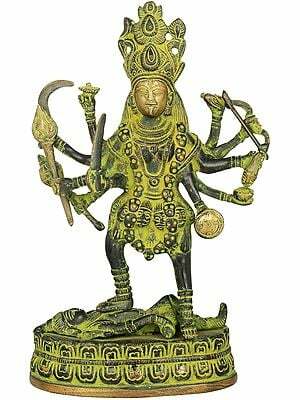 This elaborate brass sculpture is a variation of the Kali iconography, and Hers is a distinct iconography. 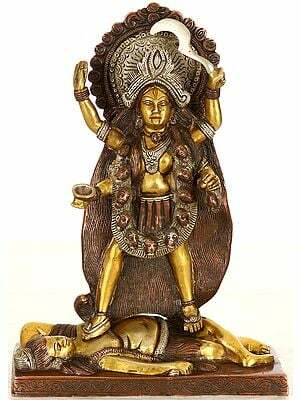 Her stance is far from the unassuming body language of Indian devies; She is clad in very little by way of clothing and shringar; and there is a ferocity about Her composure, which matches the weapons She wields in Her numerous hands. 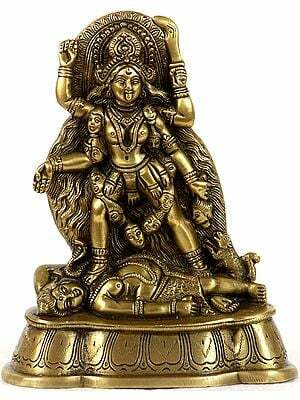 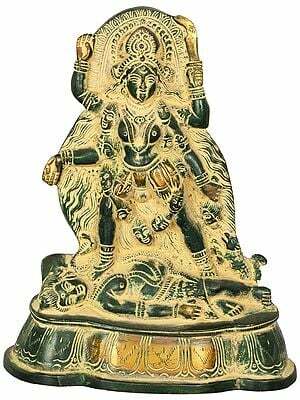 This one is a lone Kali composition, seated on an inverted lotus pedestal as opposed to stepping on Her supine husband, Shiva. 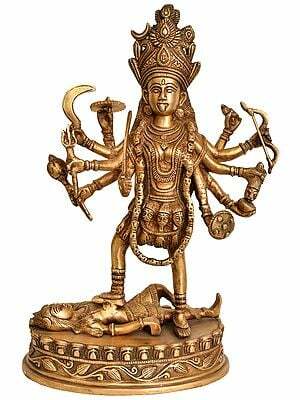 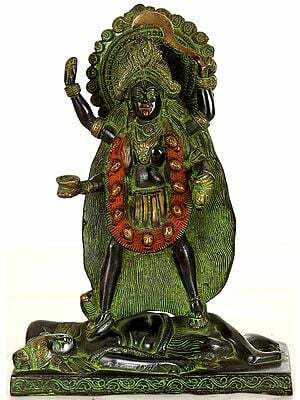 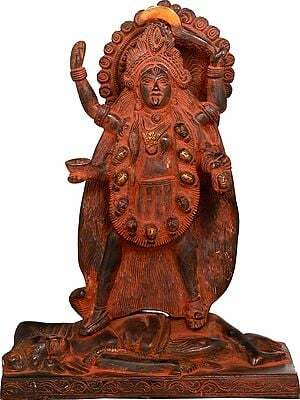 She is the ashtabhujadhari (eight-armed), and each of the spiritual implements in Her possession is enough send shivers down the adharmee's spine. 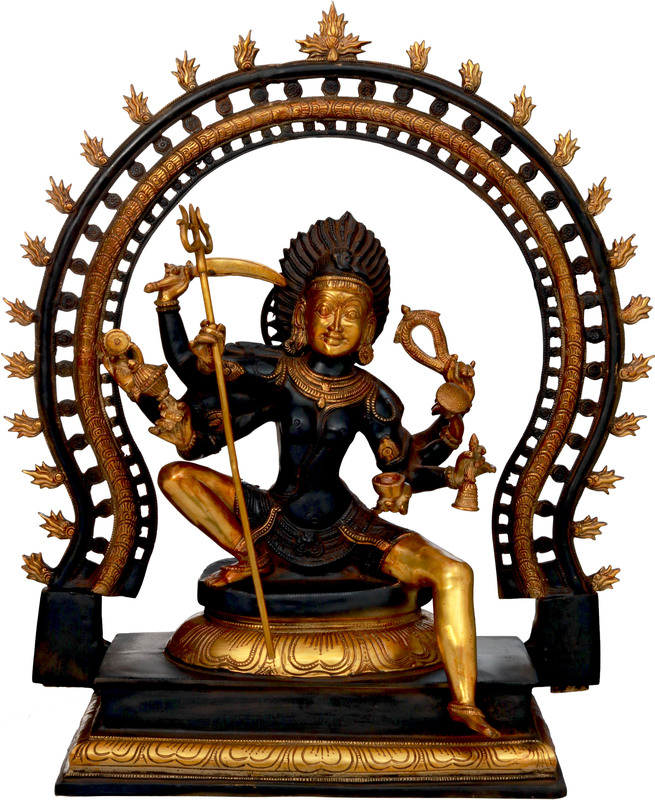 In fact, this statue is the very image of ferocity and invincibility, both of which divine qualities are writ large across Her countenance. 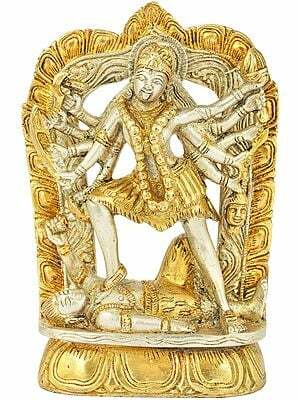 An unusual crown seemingly made from sharp spines is held in place by a band of lotus petals. 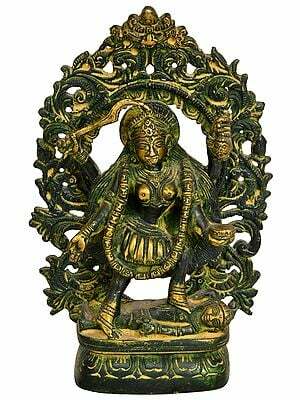 It is impossible to meet the gaze of Her raised brow without shuddering at the thought of one's own share of adharma. 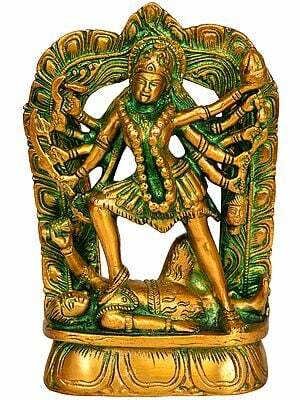 A fierce mouth completes the countenance framed by dangling kundalas from each ear. 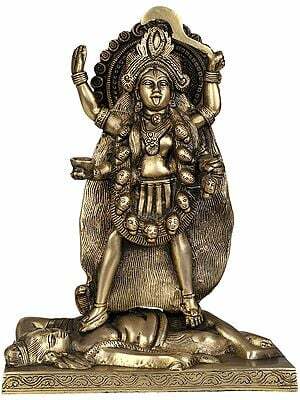 The rest of Her shringar comprises of necklaces cascading down Her torso, and a bunch of amulets and anklets that clothe Her gracious limbs. The pedestal She is sitting on is at the centre of an even larger pedestal, the base of which is engraved with lotus petals. From the base pedestal emerges a statement prabhavali (aureole) rimmed with flames that are a symbol of the destruction of adharma.